I am very excited to visit this blog today. I heard (through the computer-backup-grapevine) that my author's other characters - Grace Wheaton and the gang from the Manor House Mysteries - have already had an opportunity to talk with all of you, but today it's my turn! Thank goodness! I finally have a chance to breathe. It's been busy at the White House over the past few months (ha! when isn't it busy?) so I really didn't mind not getting a chance to blog. But now I'm here and I have lots to share. 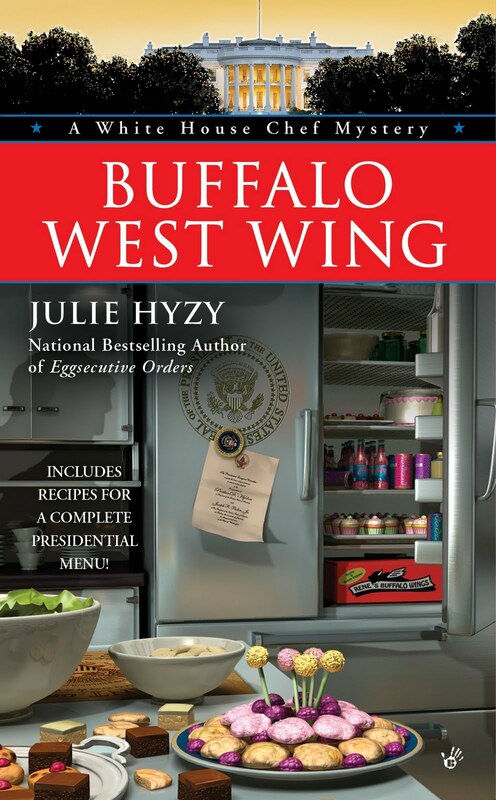 As you may know, Buffalo West Wing, my fourth White House Chef adventure, is coming out January 4th. Not only are there changes in the administration (a new president, and a First Family with young kids), but there are changes for me personally. If you've read Eggsecutive Orders, you know that I made a tough decision with regard to my love life. And, as I'm sure you also know, decisions that make sense logically are not always easy on the heart. But just when I'd given up on love... well, I won't get into that right now. You all know I'm not one to complain in a public forum, but I swear, I think my author enjoys getting me into trouble. 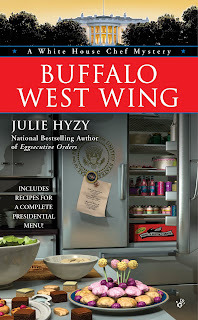 This time, in Buffalo West Wing, I tried my best to keep my head down, to do my job to the best of my ability and to let the Secret Service handle the rough stuff. But no! Even behaving myself didn't keep me safe this time. Seriously, when a box of store bought chicken wings suspiciously shows up in the White House kitchen - on Inauguration Day! - with a note that the wings are a gift for the new First Kids, do you think I'm actually going to serve them? Of course not. Problem is, not everyone agreed with my decision. Not my friend, Cyan, not Peter Everett Sargeant, not the new First Lady. Talk about getting into trouble with the boss! Turns out I was right not to serve the wings ... turns out my instincts served me well (again), but that didn't keep me out of hot water. Not by a long shot. Uh-oh, things are heating up here. Bucky and Cyan are waiting for me. So is our newest addition to the White House kitchen (More changes! But the less said about him, the better). I'd better close this off, but before I go, I just wanted to mention that this year it looks as though the First Family is staying in residence for the holiday season. That means I'll be so swamped preparing meals for them and their guests that I won't have a chance to fly home. Keeping busy keeps me from being sad about missing my mom and nana, but I would so love to see them again. Every year at this time I miss my dad, too, and I barely even knew him. Is there anyone you wish you were visiting with this year? Looking forward to hearing about your adventures with the new residents of the White House. Could your mom and nana come out to visit again for the holidays so you won't be lonely? I would love it if my mom and nana could fly out, but this new First Family entertains so often that I know I'll be working 16 hour days, at least. There's so much to be done over the holidays. If my family came out I still wouldn't have time to see them. Maybe once everything settles down... But then again, taking time off with the new guy around isn't a great idea either. Yes, there's someone I'd like to visit this Christmas - the White House, so I could enjoy the meals you orchestrate! Can't wait to hear more about your further adventures! We'll definitely be doing some Christmas visiting this year at our house! Janet - you are welcome in my kitchen *any* time!! Elizabeth - I do miss Christmas in Chicago (where Mom and Nana live) but I hope to make it back there soon. I want to come with Janet! I was already looking forward to reading about all these changes, but since you've come to dangle them tantalizingly before us, I really can't wait. Laineshots, I would love for you to come visit my kitchen. I can't wait to share this next adventure with you, too! I can't wait til 4 Jan to catch up with you all. Would love to meet up with my fam at my dad's house like we do each June for 'Spa Week', only this time would be for all of us to get together and not work on a project. Can't wait to read the newest and meet all the new characters!